Click here to see 40 photos of Cullen’s amazing apartment! In 2012, I anointed Cullen Meyer the “Crown Prince of Kitsch,” in amazement at his Brooklyn time capsule apartment, which he has decorated with all manner of vintage wonders. Recently, I saw that he had added a new toy to his playhouse — a circa-1948 Dishmaster faucet — the original hunka hunka. It’s sitting quite pretty — don’t you think? — on his Youngstown Diana sink base. 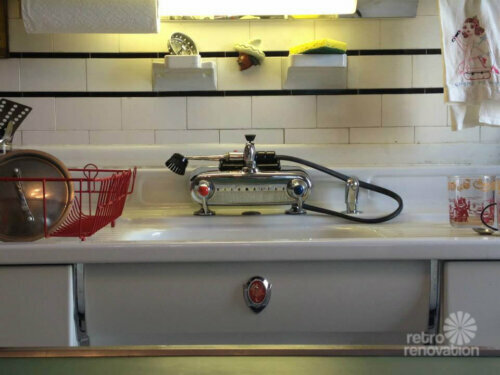 I’ve actually had it for a few years but I thought I asked for so many vintage installations from my landlord that I was waiting for an excuse and recently my kitchen faucet had been acting up, so I took the opportunity to put in the Dishmaster. 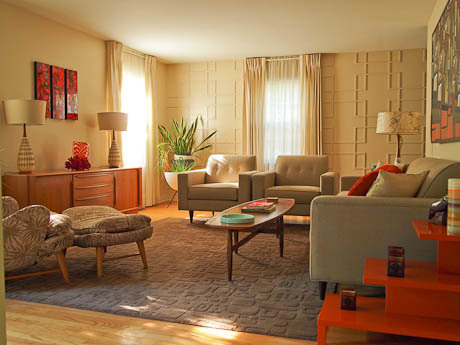 More link love: We tipped off the New York Times to Cullen’s apartment — and they did a story about it! Pam’s Dishmaster, acquired in 2010. Read it and weep. 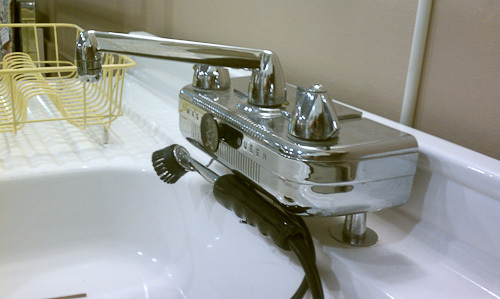 Even though the Dishmaster is retro-awesome, the Electro-Sink Center is the MOTHER OF ALL WACKY FAUCETS. Clicky-loo here to read more. 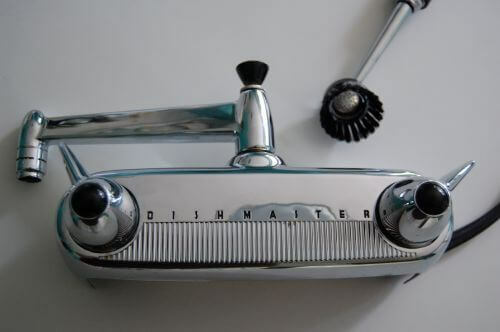 For readers who may be newish to Retro Renovation, the Dishmaster is an early design “dish washer” whose key feature is a brush wand that dispenses soapy water when you push a red button. There’s a built-in reservoir that holds the soap, and it is mixed with your hot water via that brush nozzle thingie. Cullen says that he was able to get the contraption to work as intended. Golly, maybe I need to try to install mine, excpet I currently have *projectoverload*. 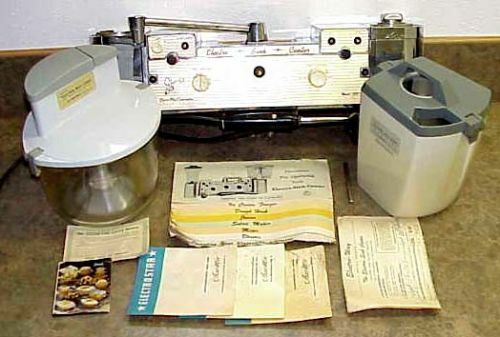 The Dishmaster is still available for sale today — although the design has evolved and the casing is no longer that heavy chunk of steel; it would be way too expensive to replicate, the owner of the company told me when I visited the Dishmaster factory. Yes: I went with my Mom on a road trip to visit the Dishmaster factory in Indiana. I also own three versions of the Dishmaster — an early model, like Cullen’s, and one each of the current designs. I also own several vintage faceplates. It’s hard to pass up a Dishmaster once you get the bug, they are so… ridiculous. In a good way. In 2012, reader Tami spotted the Dishmaster-like Magic Queen faucet. Click here to head down the rabbit hole in this direction. Bronwyn turned me on to the Dishmaster in 2009, early days of the blog. There are two designs of Dishmasters available today. I found my circa-1948 Dishmaster at The Amazing Electrolux Salesman Estate Sale. Vintage Dishmaster faceplates available (readers snapped them up). 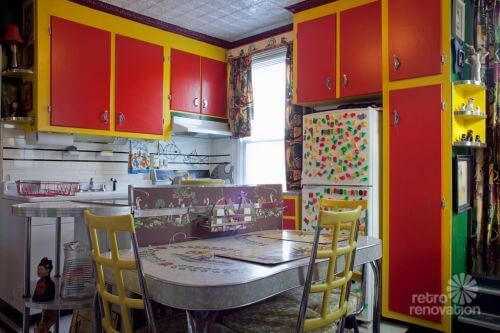 A competitor is discovered: The vintage Magic Queen kitchen faucet. 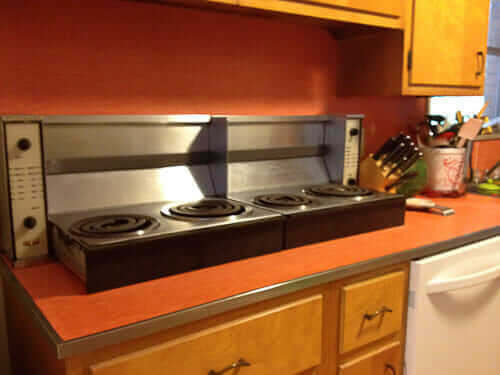 Carrie put a Dishmaster into her epic kitchen remodel. Sarah put a Dishmaster into her cute kitchen remodel. Oh… there are more…. it seems I have 84 references to the Dishmaster here on the blog that come up if you type Dishmaster into the search box. Holey Dishmaster, Batman! 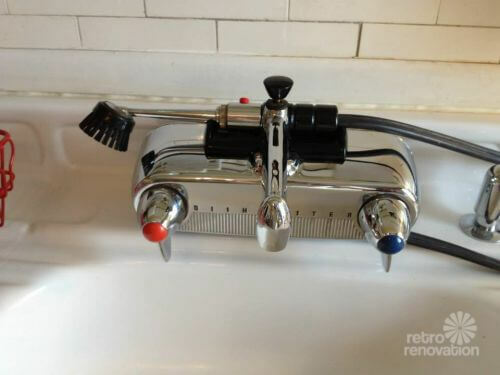 While I think the faucet is cool, I’ve lived in old house apartments and had sinks like those….and well…they aren’t too cool…and I love vintage but for me, I could do away with the whole cast iron, single sink idea..but very cool faucet..
That said, of course, to each her own! Cullen, let me know if you are ever coming to Colorado. I’d love to hob nob with you and pick your brain. Lucille is still waiting to rock around the clock! I’d love to have one, but haven’t been able to justify the $200.00 cost as of yet. (The Caliber needed new struts and bushings, which cost $1200.00.) I do not recall Magic Queen, however. 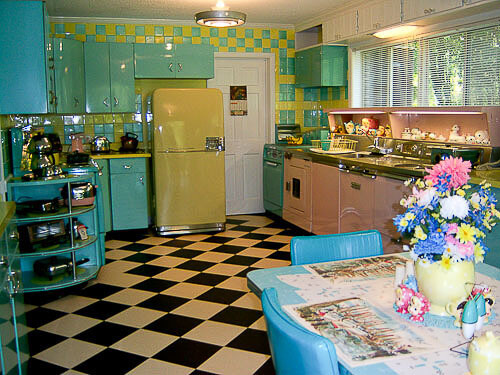 But I do remember the ubiquitous Dishmaster in Laura and Rob Petrie’s kitchen. Oh, how I loved that house, and still find it hilarious that women ran around in dresses (sometimes with aprons) and men ran around in suits, even when lounging at home! I missed the one on “Hot in Cleveland.” I’ll have to watch for it. That show is one of the best on TV today, and Betty White is still the bomb! Worth it. Well I my eyes. Figure w decent faucet can cost close to it. But doesn’t even wash our dishes. Love love mine.